Skills and Knowledge: This is the core. Learners’ sense of self and their value to others starts here. “I know what I know!” and “I know what I can do!” are the essence of professional identity. The practice that needs to develop is how learners can share what they know, and do so in a manner that cuts across the other realms of competency and acculturation. How do learners make sense of these three realms? This is where Personal Knowledge Mastery (PKM) becomes critical, and where learning professionals can continue to earn their keep. The new mental map individuals need to create—and the practices that support it—rarely just happen. They are learned, which is to say taught and developed. As we noted, at the core are skills and knowledge. What could be more personal than “I know what I know”? But we don’t live in a world of personal expertise anymore. We operate in a connected, social, networked world. 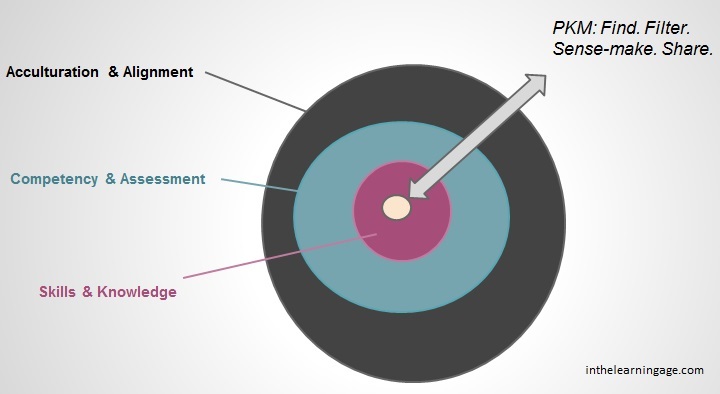 Learners need to measure and make sense of their personal knowledge and skills with and through their coworkers and professional peers within and outside of their organization. They must also ensure that their activities–even those with their peers across the globe—align with an organizational culture so that they’ll symbiotically nourish each other: Workers add value in a way that their organization appreciates and grows from, and their organizations push them to continue to learn and grow their own knowledge and skills. 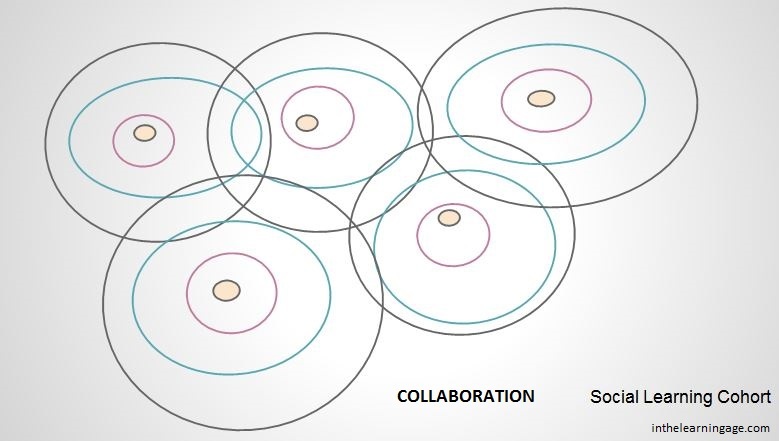 When fully realized learning workers collaborate—that is, work on specific projects and in small learning cohorts—they carry these three levels with them. As much as possible, all members of the team are open and transparent, without hidden agendas or the fear that leads to withholding “secret” knowledge and abilities from others. 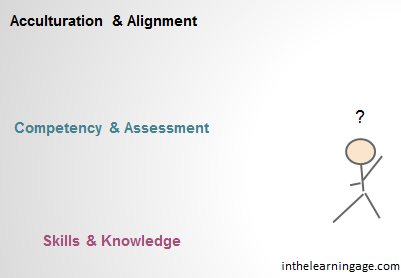 Their “layers” of alignment and competencies overlap with others inasmuch as is required for the specific task at hand. The limitless realm emerges when learners are actively engaged in the network of peers from across their organization, profession and even the globe. 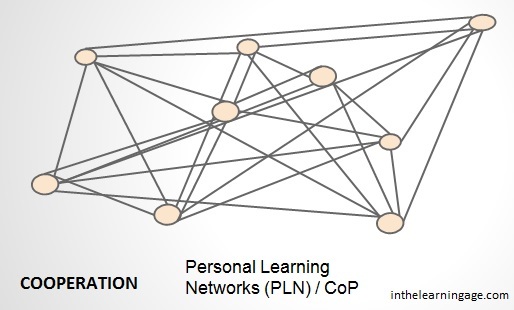 Through their Personal Learning Network (PLN)—a living entity that requires attention, pruning and measured growth—they are exposed to new ideas, applications, mindsets and innovations. This is where our realms of cultural alignment and competency assessment can fade away—where each “node” in the network is taken at face value, in open cooperation. We are well aware that new ideas rarely come from within an organization or cohort team, but rather at the edges of practitioners with very different cultures, competencies and skills. But, learning professionals have to help prepare learners to filter these ideas through the layers that surround their core skills, so they add value to their organization and their organization encourages and nurtures their far-flung explorations. So, this is my In The Learning Age manifesto of sorts. While at some point I will hire a professional graphic designer to help me refine these, until then I welcome your thoughts, ideas and counter-arguments. Leave a comment or contact me directly. I appreciate those who have been reading along as I travel this road. * I use learner and worker here (nearly) interchangeably: Learning is the work!